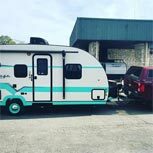 Princess Craft Campers is a RV dealer in located in Round Rock, Texas. We carry a wide variety of fantastic new RVs for sale, as well as used RVs for sale. We also offer RV rentals for those looking for a more temporary RVing option. No matter what you are looking for in terms of RVing, we can absolutely help out! If this sounds like what you are looking for, make sure that you contact us today for all of the details.